Las Vegas is something else. It is an incredible place but I don’t wholly mean that in a good way. Most towns and settlements are near water, water being essential for human life and all. Las Vegas, however, is a town built inexplicably in the middle of the Nevada desert. There is not a drop of water in sight. Each day brings blazing desert temperatures. I burned myself badly on a seatbelt buckle the first time I went to Vegas. Nowhere else in the world have I seen pierced hosepipes elevated above pavements spraying a cool mist over pedestrians. It is very, very hot. 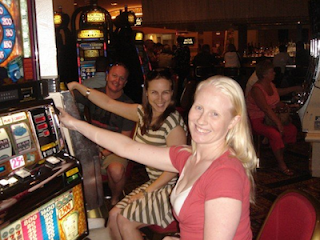 If you are wondering what sort of casinos to expect then let your imagination run wild. Caesar’s Palace is huge and built in enormously over the top Roman style, the Bellagio is designed with Italian opulence in mind, complete with canal-weaving gondolas in the public spaces. The Luxor is glossy and pyramid-shaped, the New York Hotel Casino is an accumulation of all New York’s most famous buildings. Even the Eiffel Tower is here, as part of Paris Las Vegas. Basically, if you can imagine it, someone has built it. So this makes it an ideal spot to go out on the lash right? Many a night was ‘lost’ in Vegas I fancy. It is popular with parties, lads holidays and girls trips too. Last time I was in Vegas was for a wedding. My friend’s wedding was a planned event, with family flown in and every detail of a wedding as you would imagine one (alright maybe you didn’t expect Elvis to turn up but he was great fun.) Of course Vegas also has a tradition of speedy, often regretted, weddings and a visit to Vegas is not complete without checking out the ‘Little Chapel of Love’ Whether you go in or not is your business. Vegas is a fun place to visit, but it is also ridiculous and completely over the top. Something in me feels a bit sad when I’m there though. It’s hard to explain but I wonder about the dark side of Vegas. When Vegas’ reputation is built on gambling and partying, I can’t help but wonder how many lives have been ruined there. Also do the locals get sick of all the lights and the noise? I certainly do after a few days and I was only visiting. Viva Las Vegas – just don’t make me live there.